The Ukrainian Institute of Modern Art is pleased to present “Sedimented,” a 4-person exhibition featuring Chicago-based artists Stephen Eichhorn, Gunjan Kumar, Judith Mullen and Toby Zallman. These artists not only share an interest in the intersection of the natural and the manmade, but the manner in which they create their multimedia works have conceptual and literal processes in common. In different ways, the artists are all gatherers of images and materials –as if a multitude of ephemera and ideas have been loosened from the world around them and collected, settling within the artists’ studios and their works. Stephen Eichhorn’s collage works are the product of a fastidious practice of cutting images of flora from botanical publications. From these accrued piles of carefully incised, paper plant life, the artist sorts and selects the images that are then adhered to luminously colored, and reflective grounds. In Eichhorn’s “Cats & Plants” series on display here, cut-out foam core cats are adorned with bizarre arrangements of houseplants: a thorny totem of cacti piled high upon the animal’s head, or spiralling echeveria succulents where the eyes should be. In these works, Eichhorn juxtaposes two of the most common ways we incorporate elements of nature into our human world, giving viewers an unexpected recasting of a familiar, domestic condition. For Gunjan Kumar, too, laborious precision is the basis for art making, though for Kumar, that labor serves a symbolic purpose. Kumar’s works in “Sedimented” feature the unmistakable, deep golden hue of turmeric. Combining the turmeric powder with organic glues, fabric, paper and minerals, the artist creates symmetrical grids and spirals of turmeric cones. These cones are formed by hand, in a repetitive circular motion –a process that signifies the unification of beginning and end. Kumar draws from the visual and cultural traditions of India, where she was born, and as these influences are filtered through her making process, they result in a thoroughly transcendent and sublime aesthetic experience. 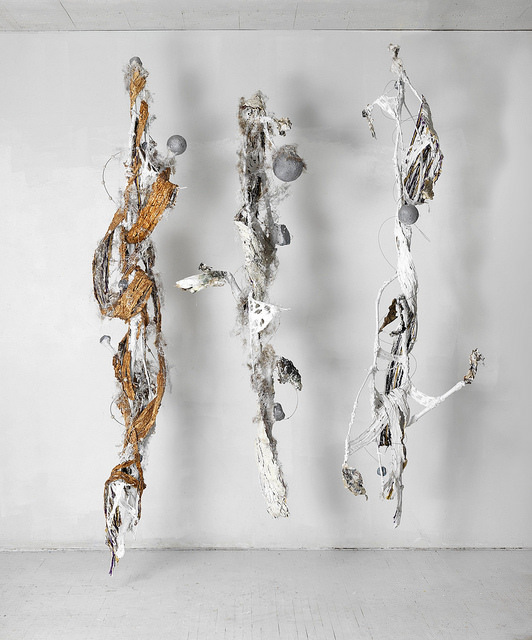 The content of materials is likewise crucial for Judith Mullen, who combines organic and inorganic media in her sculptural works, manifesting the sensation of having one foot in the natural world, and one in the human. Clay and tree branches are treated in the same manner as steel wool and Styrofoam, merging into airy, rather precarious objects. The artist likens these abstracted yet markedly physical pieces to the way in which our human consciousness contends with the instability of memory and the substantiality of the present. Mullen’s works here blur the distinctions between many seemingly disparate ideas, at once recognizable yet fantastical. Toby Zallman’s commingling of nature and manmade imparts a distinctly environmentalist message via her multimedia installations and wallbound images. In Untitled PB4, innumerable, disposable plastic shopping bags are shredded, twisted and wound with steel mesh, composing a vaguely botanical, alien landscape. The texture of the bags has been transformed, though by no means have their environmentally dangerous characteristics been expunged from the meaning of Zallman’s works. Like her three-dimensional pieces, Zallman’s graphite and photographic works on paper are visually dynamic and enticing in their treatment of the plastic bag; however, underlying that beauty and material ingenuity lies a palpable sensation of danger and hazard. Sumi Ink, Mulberry paper, 19 x 20.5 in. 13.5 x 10 x 0.5 in. 92 x 71 x 66 in. 10’ x 6’ x 3 ft.